Then-junior Joe McDonald drives against Penn State guard Shep Garner in last year's 64‒51 loss. 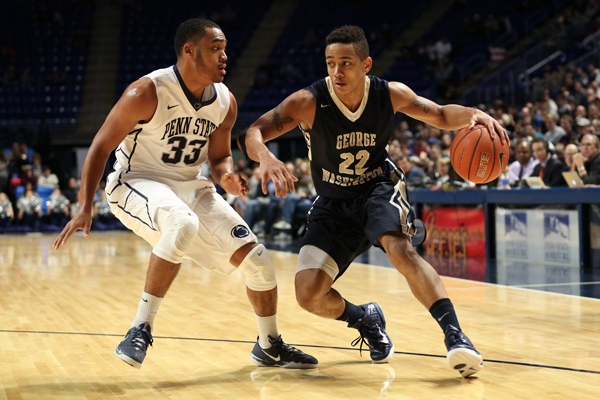 The Nittany Lions are one of six power conference teams on GW's 2015–2016 schedule. Despite a 20+ win season for men’s basketball last year, the team could not find its way into the NCAA Tournament. The team had the 86th strongest schedule in the nation in 2014–2015 and seventh strongest in the Atlantic 10, according to ESPN. Only a year before that, the Colonials went dancing after posting a dominant 24‒8 overall record. That season, GW had the 61st strongest schedule in NCAA Division I and fourth in the A-10. Head coach Mike Lonergan said he, his staff and athletic director Patrick Nero worked hard to get big name schools to Foggy Bottom this year. GW will square off with its toughest opponent in just its second regular-season game. The Virginia Cavaliers, who finished at No. 6 in the country and were selected as a No. 2 seed in the 2015 NCAA Tournament, will visit the Smith Center on Nov. 16. Collegeinsider.com selection committee chairman Jamie Kachmarik said Virginia, which went 30‒4 last season, will bring back the majority of its roster, and could again be one of the top programs in the nation. “They can end up being a team that you could talk about in late March, first week of April. So right off the bat, [GW] strengthens its schedule up pretty well with that one,” he said. An exhibition with Gannon (DII) (Nov. 7) and a season opener against Lafayette (Nov. 13), which made an NCAA Tournament appearance last year for the first time since 2000, will give the Colonials a nice opportunity to develop some team chemistry before facing the ACC powerhouse. While three more wins should follow for GW when they take on less-intimidating teams like South Florida (Nov. 19), Army (Nov. 22) and Gardner-Webb (Nov. 24), Kachmarik thinks the Colonials should not take the stretch for granted. GW heads to Brooklyn next to face either Cincinnati, Nebraska or Tennessee (Nov. 27 and Nov. 28). The Bearcats, who finished at 23‒11 last year, could be in the Associated Press Top 25 conversation while the SEC’s Volunteers, with new first-year head coach Rick Barnes, could also be a threat according to Kachmarik. The Colonials will also host the back end of three home-and-home agreements with Big East opponent Seton Hall (Dec. 2) and Big 10 foes Penn State (Dec. 8) and Rutgers (Dec. 12) at the Smith Center. “Penn State and Rutgers are two Big 10 teams who have not been at the top of the Big 10 lately, but those are good games for a team like GW because those are two opponents I’m sure [GW] feels like it can compete with and get a couple wins,” Kachmarik said. GW lost to Seton Hall and Penn State, but defeated Rutgers last year on the road. The Colonials, who lost only two games in the Smith Center last year, played just 14 home games last regular season but the agreements will help boost that number to 17 this year. A visit from Saint Peter’s (Dec. 19) concludes GW’s four-game homestand before the team faces DePaul (Dec. 22) and UCF (Dec. 29) on the road to wrap up its non-conference schedule. GW defeated the Blue Demons last year at home. The Atlantic 10, which will nationally televise a record 107 games in 2015–2016, had six teams, including GW, reach the postseason last year. The Colonials came away with a winning 10‒8 record, but need to do better this season to secure a spot in the field of 64 come March. Only three A-10 teams made the NCAA Tournament in 2014, a noticeable drop off from six in 2013, but Lonergan said more experienced rosters will make the conference more competitive. GW will face Davidson, Duquesne, George Mason, Richmond and VCU both at home and on the road next season. The Colonials combined for a 4‒6 record against the five teams in the 2014‒2015 regular season. The Colonials will also host Fordham, La Salle, Rhode Island and Saint Joseph’s, all teams they visited last season, and will instead travel to Dayton, Massachusetts, Saint Bonaventure and Saint Louis this year. GW finished at 3‒6 in nine A-10 road games last season, struggling away from home even against weaker teams like Duquesne and La Salle. While the A-10 road slate this year looks slightly less difficult, Lonergan knows no team will go down easily.